In sixth pAsuram – AzhwAr says “Oh emperumAn who has such love towards me! even if you don’t unite with me, your existence itself is my sustenance etc”. Why is AzhwAr now talking about his own love towards emperumAn [as this decad is about emperumAn’s love towards AzhwAr]? It is to indicate that the great love of emperumAn towards AzhwAr, caught on to AzhwAr and made AzhwAr also reciprocate such love towards emperumAn. Sixth pAsuram. AzhwAr says “even if you, who has such love towards me, do not come to me, your existence only is my sustenance etc”. AzhwAr says “Though I did not help you, just as my existence is your sustenance etc, even if you don’t come, your existence is my sustenance etc”. While, AzhwAr is talking about emperumAn‘s love, why did he mention about his own love here? When two people unite and enjoy, the joy which is derived is common for both; in this, previously AzhwAr spoke about emperumAn’s love; now, he is saying that emperumAn’s overflowing love made him to manifest such love towards emperumAn as well. nArAyaNanE – Oh nArAyaNa (who has natural relationship)! kOlam Am – shining radiantly as decoration. Even if I said “Oh nArAyaNa who is holding in the beautiful divine hands, the thiruvAzhi which is having the nature of becoming kAla (the destroyer) and SrI pAnchajanya conch which has (contrasting) white colour, and who places the world in your stomach, protecting it and then spitting it out to let it see the outside!” repeatedly, cried out and I called you, and if you don’t arrive or don’t show any indication of your arrival, your infinitely enjoyable lotus flower like divine feet which make sounds of bravery are the shining radiant decoration for my head. AzhwAr indicates “Love at your divine feet is that which sustains me”. kAla chakkaram … – This is how AzhwAr calls out. 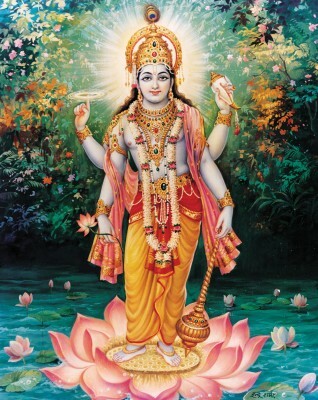 Oh one who gently holds [like holding a flower] the divine chakra which is an enemy for the opponents and white Sanka which is a contrast for your dark complexion, in your beautiful hand, which should be checked for evil-eyes even when there is nothing on them [what to speak, when the conch and disc are present in them?]! Like pristine whiteness is the identity for pAnchajanya, destroying the enemies is the identity for thiruvAzhi (sudharSana chakra). gyAla muRRum … – When he is decorated with these weapons as ornaments, instead of remaining indifferent when his vibhUthi (belongings) is suffering, he would help when needed. During total deluge, he would place the world in his stomach and protect it, and when the deluge is over, he would let it out – in this manner he will completely protect all. nArAyaNanE – Protecting fully in this manner, and the protected ones not having to feel “He protected me, how am I going to payback?”, he is naturally related. One does not feel “My mother cared for me when I was in her stomach, what can I do for her in return?” – that is due to natural relationship; emperumAn is also similar to mother as said in periya thirumozhi 11.6.6 “thAy irukkum vaNNam ummaith than vayiRRiruththi uyyak koNdavan” (Like a mother, he kept you [all] in his stomach and protected you). enRu enRu – Speaking about the combination of the divine hand and the AzhwArs (weapons, Sanka and chakra, who are indicated as SangaththAzhwAr and chakkaraththAzhwAr), his protection as required at specific times, the natural relationship even if such beauty and helping tendency was there. By repetition, AzhwAr‘s individual engagement in each aspect is highlighted. Olamittu nAn azhaiththAl – When I who is powerless, call out for you. When I call out in high pitch so that you hear my cry and are shaken so much that you have to come, even when you are in paramapadham. OnRum vArAy Agilum – As said in mahAbhAratham udhyOga parvam “… kuSasthalE nivasathi sa cha prAtharihaishyathi” (Oh vidhura! krishNa who came from upaplAvya, is now staying in kuSasthalam. In the morning, he will arrive here), even if there is no scope for “he had left from his abode and have arrived here”. “nAmagrAhancha nAthasya SIthala: kAhaLadhvani:” (The trumpet sound which resembles the name of krishNa, will have a cooling effect). kOlamAm en sennikku – For my head which considers as said in SrI rAmAyaNam ayOdhyA kANdam 98.8 “yAvanna SaraNau bhrAthu: pArthivavyanjanAnvithau | SirasA dhArayishyAmi na mE SAnthirbhavishyathi ||” (Until I behold the divine feet of my brother SrI rAma who has all qualities of being a king, I will not have peace), [your divine feet as] decoration. un kamalam anna – As people would desire to wear fresh flowers [AzhwAr is desiring the lotus like divine feet of emperumAn]. kurai kazhalE – kurai can mean vastness, which indicates enjoyable nature of the divine feet; it can also mean the sound of ornaments [decorating the feet]. Why is AzhwAr saying “vArAyAgilum kOlamAm” (even if you don’t come, your divine feet are my decoration)? AzhwAr says “You should not avoid coming here. But if that happened [you did not arrive], this is my thinking”. AzhwAr is saying “you have pushed me to such a state [of deep attachment towards you]”. Naturally, AzhwAr would say “ninnalAl ilEn kAN” (I won’t exist without you). This entry was posted in thiruvAimozhi, thiruvAimozhi 4th centum on January 26, 2017 by Sarathy Thothathri.